Siragu Montessori School, a unit of Suyam Charitable trust, provides free education for homeless and under-privileged children. The school supports more than 400 children and about 100 children stay at Siragu shelter home. A beautiful brook runs around the school and flows past its entrance. A small bridge, which lay on level with road, connects the school entrance to road. Owing to its size and weak structural rigidity, no vehicles could ride over that bridge except two-wheelers. During the flood in 2015, children were trapped inside home as floodwater gushed over the small bridge; People carried the children on their back for evacuation. 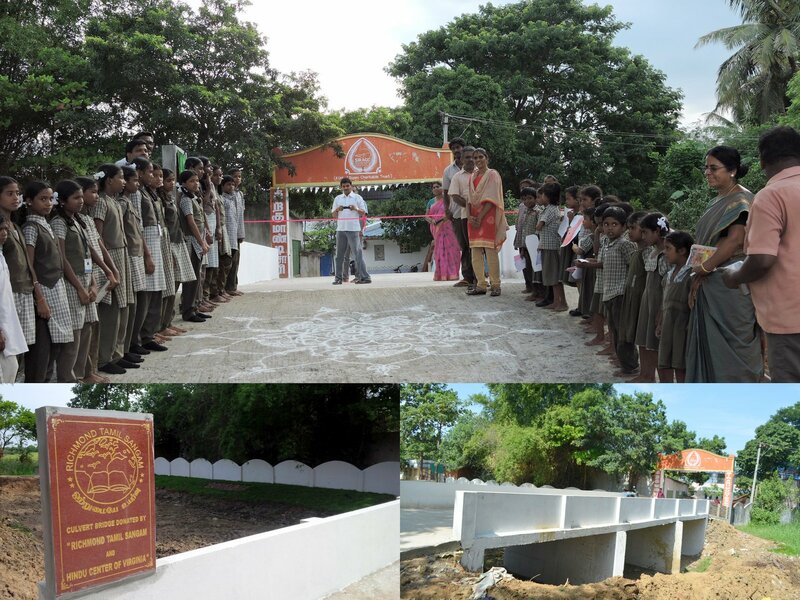 During flood relief activities, the bridge was demolished and a new larger culvert bridge was constructed, connecting school to the access road. The motive was to build a safe, rigid evacuation route for people in school in case of any emergency. In addition to safety, the culvert provides proper channel for brook water. Richmond Tamil Sangam and Hindu Center of Virginia graciously contributed through Bhumi for this relief project. All the village people thanked and appreciated the construction of Culvert Bridge. They consider this as the best bridge every constructed in that locality and is now a model bridge.